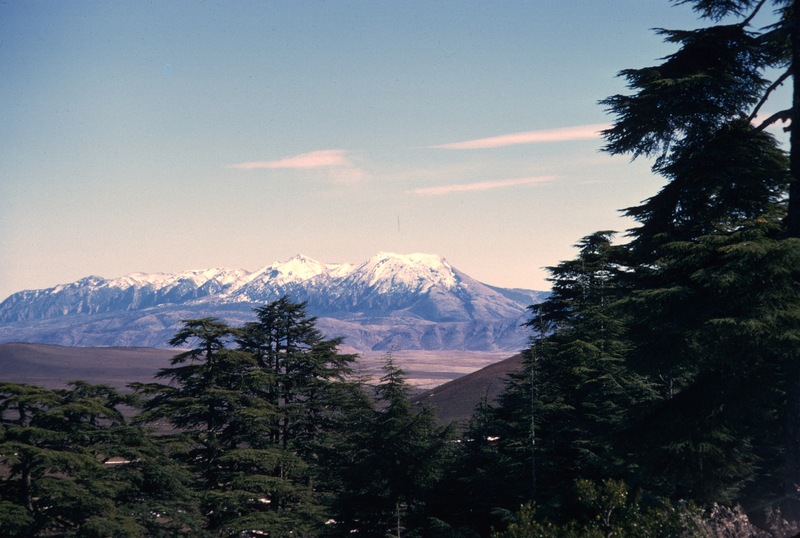 Jbel Ayachi is the highest mountain of the eastern High Atlas. It appears from much of the eastern Middle Atlas as a long, snow-covered ridge that looms, all winter long, above the halfa covered plains of the Upper Moulouya River. 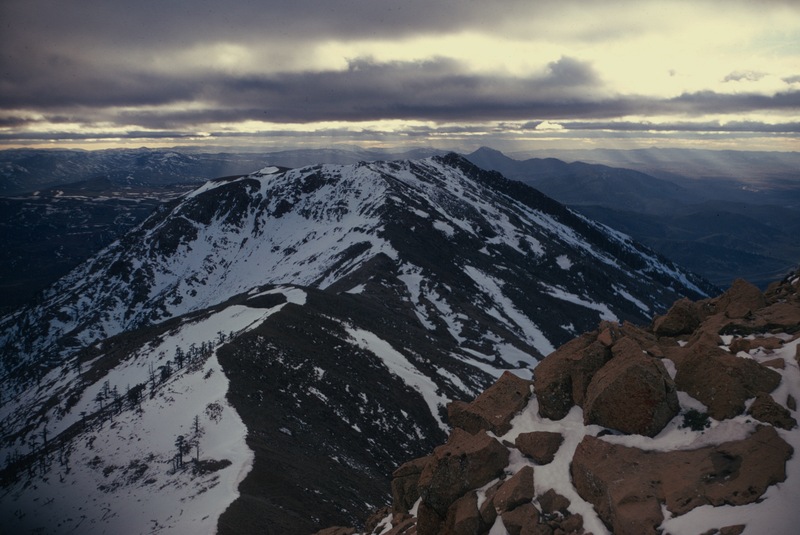 Until precise geodetic measurements were made, some considered it the highest point of the Atlas, but Jbel Toubkal is over 400 meters higher, and many other High Atlas peaks exceed its height. Ayachi’s prominence arises from its proximity to the plain that borders it. When I worked for the Ministry of Agriculture, Fes Province extended south to Missour, but most of my work was in the Saïs and the pre-Rif. I most often saw Ayachi as part of the faraway, snow-covered High Atlas crest when I traveled across the Middle Atlas plateaus. 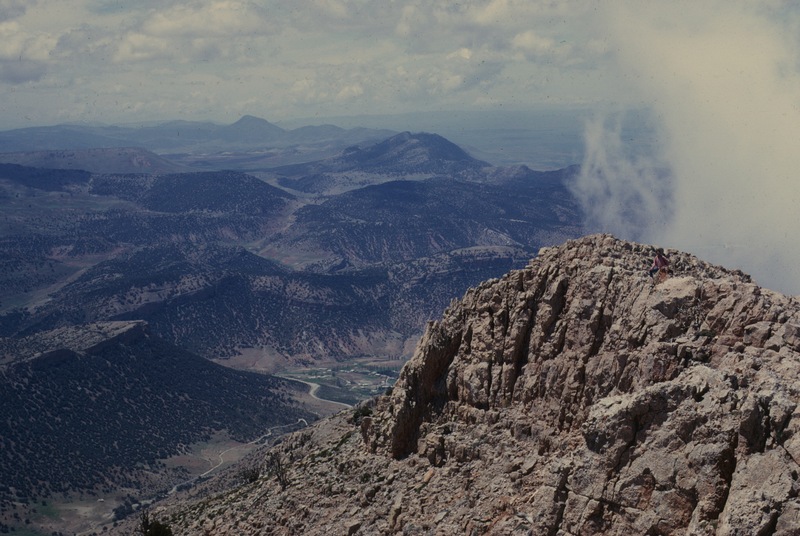 In the spring of 1969, however, I convinced my buddy, Gaylord Barr, who shared the Sefrou house with me, to drive down to a place known as the Cirque de Jaffar, which is a good starting point for climbing the mountain. We had no intention of doing that. We were just playing tourists for a day. We were able to do this because I had an old Willys Jeep for my job in Fes, and though I was not supposed to use it to sightsee, I did so once in a while. The French use the word cirque loosely. When connected to mountain terrain, it is technically a term for a bowl carved out of a mountain valley by a glacier. The Atlas show little signs of glaciation. Even among the highest peaks in the Toubkal area, little snow survives the hot, dry summers, and glacial features are lacking. The Cirque de Jaffar is not glacier made, just a deep indentation in the edge of the mountains made by a stream. In this sense, it is a bit akin to the Cirque de Navacelle, a river-formed depression on the edge of the Massif Central, north of Montpellier. However the Cirque de Jaffar was formed, the natural scenery around it is spectacular. Some tourists pass through it en route to the Todra Gorges, but the piste is rough and this route probably should only be considered by those with solid four-wheel-drive vehicles equipped to operate off the road. The piste from Midelt to the Cirque, though unpaved, wasn’t bad at all when I was on it for the first time in the spring of 1969. May is a wonderful month in Morocco. The weather is warm and sunny, and the wheat fields are green. Wildflowers are everywhere, and the rivers and streams are brimming with water from the melting snows of the Atlas. The frigid cold is gone, but the land has not yet been baked dry by the unrelenting summer sun. The drive from Sefrou to Midelt follows the old treq es-Sultan. The King’s Road connects Fes to Rissani and the Tafilalt, the birthplace of the Alouite dynasty that governs Morocco today. The road climbs over successive Middle Atlas plateaus, passes through Boulemane, under the shadow of Jbel Tichoukt, and then descends to the the Upper Moulouya plains. It is an easy drive, though winter snows can make it difficult for truckers. After a storm it is not unusual to see trucks that have slid off the slick highway. The Upper Moulouya is covered with halfa, Stipa tenacissima, a grass that is woven into ropes and mats, and also used in the mattresses of those not wealthy enough to bank wool. All my banquette mattresses were stuffed with halfa, as was the mattress of my bed, and though not as comfortable as wool, the scent of the grass was sweet and pleasant. Halfa is also known as Esparto grass, and grows over wide areas of the Maghreb and Spain, and everywhere it is used for artisanal purposes. In the rain shadow of the Middle Atlas, agriculture in the Upper Moulouya requires irrigation, and herding is common. In the past, when Morocco was divided between the Bled es-Siba and the Bled el-Makhzen, the powerful Berber tribes of the Middle Atlas moved their flocks between the Moulouya and the plains surrounding Meknes and Fes, practicing a transhumance involving summer pasturage in the Middle Atlas mountains and winter in the lowlands. At Midelt, the itinerary leaves the paved highway, and becomes a dirt and gravel track, which Moroccans often denote by the French word, piste. Climbing along the edge of the mountains, the piste reaches an altitude at the Cirque, where it is high enough for cedars to grow. From that point, there are great views of Ayachi. All along the way, the fields were full of wild flowers which we stopped to photograph. 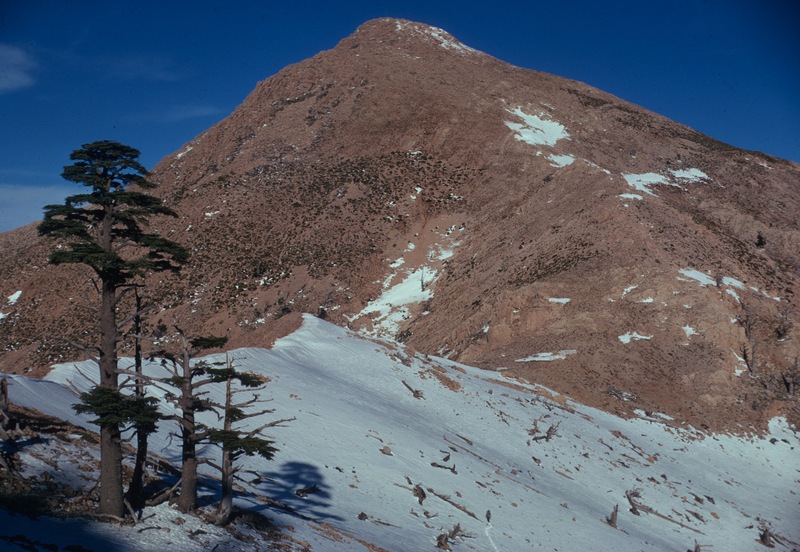 In the cirque itself, the cedar forest was open with isolated and gnarled trees. Alas, on one of many photography stops, I did not use the parking break. It was only by chance that I notice the jeep rolling back down the mountain road. I shouted to Gaylord, and he caught up with it and jumped in, but sadly he was too late. The jeep slipped off the road. Luckily, he wasn’t’ hurt. Our jeep ended in the drainage ditch on the mountain side of the road, and was not traveling fast enough to be damaged badly. The windshield had cracked, but did not shatter. On the other hand, the ditch was deep, and the undercarriage was caught up in such a way that even the jeep’s four-wheel drive couldn’t get any traction. As we wondered what we could do to get out, a forestry officer rode up on his mule, but the jeep was too heavy and too stuck for the three of us to lift it up and out. Then an elderly French couple, touring in their Peugeot 404, happened by. They kindly lent us their little emergency shovel, and we dug out enough of the jeep to get back on the road. We thanked them, they continued on their way, and we, thoroughly chastened, returned to Sefrou without further incident. A Moroccan rule of thumb is whenever you are stuck along a road, someone happens by to help you! Another time, later in my life, I was driving from Chauen to Tangier in a winter rain storm. The battery of my little Simca 1000 wasn’t charging. I think the problem was corrosion on the battery terminals, but rather than clean them, I decided to chance not stopping on the trip and fix things in Tangier. I could easily roll the car fast enough to start it. To compound my stupidity, I chose to take the coastal road, not the main Tetuan to Tangier highway. About halfway between Tetuan and Tangier I came over a rise and descended into a valley where there was mud on the road and water running over it. The car became mired and stopped dead. The water was high enough to lap at the door sills. Rain was pouring. It was pitch black. I opened the car door to see how high the water was, and my glasses fell into the running water. At that point I began to wonder how much worse things could get. I did not have another pair of glasses with me, and I am very nearsighted. I began to take off my shoes and socks in preparation for a search, but luck was with me and blind groping in the mud without leaving the Simca proved sufficient. I found them! Better yet, a group of men from a local douar appeared out of the darkness, and they were able to push the car out of the mud. Then they gave me enough of a push to start the car. I thanked them and rewarded them, and, though I secretly wondered if they just hung around waiting for cars to get stuck in that spot, I was very, very grateful. In a later post, I will write of yet another personal stupidity involving cars and batteries that left me stuck halfway between Taza and Fes. The encounter with Ayachi in May 1969 whetted my appetite for a real exploration of the mountain. I knew it was an easy ascent. I got my friend and climbing buddy, Louden, the Peace Corps doctor, to drive down to Ayachi in August. The director of the CT in Sefrou, Si Kammir, knew the supercaïd in Midelt, and arranged to get a local man to guide us. We drove directly to the cirque, where we camped that night. After the dry and hot on plains, the air in the cirque was refreshing. The guide showed up on his mule the next morning. He had been waiting at a location closer to Midelt, where another trail led to the summit. He must have been dead tired, riding much of the night after he figured out where we probably were. The cirque trail follows a stream that goes through a narrow defile to pass through the lower hills, then just climbs up through relatively wide valleys. There really is no trail once one starts up. The mule went most of the way up the mountain, only stopping just under the summit. The presence of numerous goat trails showed that shepherds took their flocks almost to the summit. We had no map, and decided that the more prominent western summit was the high point. When we got there it was clear that it wasn’t. By then it was late in the day, so we descended, tired and disappointed, not only that we hadn’t reached the main summit, but also that the scenery, dry and parched, was so uninteresting. There was no water, a regular problem on the high peaks of the Atlas, but we found some snow and melted it. The best views were to a huge anticline to the west and downward into a valley. The southern view was mountain after mountain with no vegetation. The eastern view was blocked by the main ridge of Ayachi. We decided that we would return and do a spring climb. And so we did. 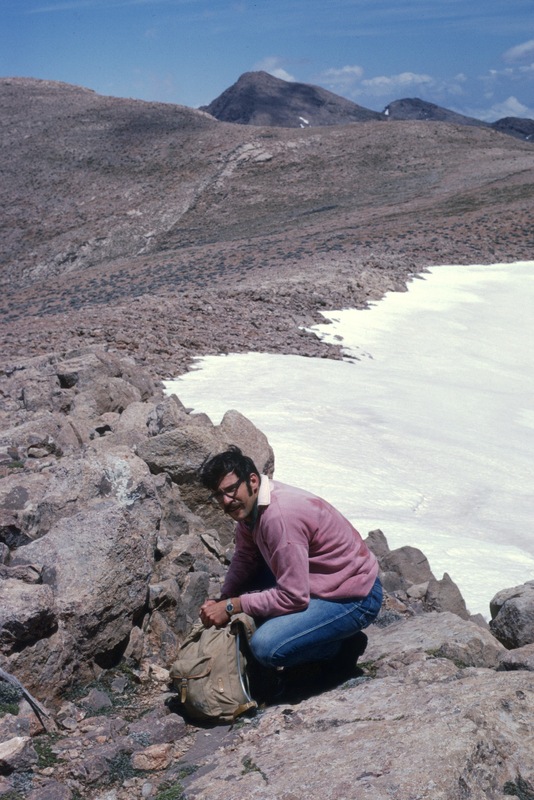 In March of 1970, Louden, Don Brown, and myself, equipped with down parkas, ice axes, and crampons camped at the Cirque, along with some Berber shepherds, who had their flocks there. We got there late in the afternoon, and set up camp. I arose in the night, probably to relieve myself, and looked up. The air was brisk, and the sky dark, clear, and full of stars. There were no lights visible anywhere, except for a spotlight shining from the top of a mountain on the left side of the cirque. This puzzled me until I figured out that I was looking at a comet, the first that I had ever seen! It was in a position that made the tail appear to extend off the top of the mountain, and the lack of light in the sky enhanced its brightness. I have seen several comets since, but none have been as striking as the first. We got off to an early start and followed the same route that Louden and I had used the previous summer. Don petered out at a lower altitude than the mule had climbed to on the previous trip, but Louden and I continued up to the highest point on the mountain. This time the vistas had snow and greenery. It was cold and we only stayed long enough for some pictures. The descent was uneventful. The trip was eventful for other reasons. Gaylord had gone to Aïn Kerma, south of Oujda, to visit the father of one of his lycée students at Sidi Lahcen Lyoussi. Marc Miller, a Morocco X volunteer who was by then in Casablanca working in fisheries, went along with them, but only stayed a week before returning to Casablanca. Shortly thereafter our paths crossed at the Hotel Royal, a Peace Corps haunt, clean and affordable, in a rooftop single that cost even less because it was unheated. I was on my way to what was then the U.S. Air Force base at Torrejón outside Madrid on a flight from the U.S. Navy base at Kenitra. Marc was on his way home to the U.S., though he did not tell me. When I returned to Morocco, and found out he had left the Peace Corps, I was shocked and bewildered. When I saw him again in the U.S. he explained everything. Marc had contracted meningitis the previous year, and was hospitalized at the base hospital at Kenitra, where Gaylord and I went to see him not long after he regained consciousness. Marc looks well in the photo below, but he was still working to regain his memory. Gaylord and Marc outside the hospital room. Marc was one of the volunteers with whom I had developed a friendship in Morocco. In the Morocco X program, he was stationed at a CT in Azrou. I was at a Centre des Travaux Agricoles about 13 kilometers south of Meknes, off the main road to El Hajeb and Azrou. Marc was open and friendly, and always willing to lend a hand. When I had trouble with the hens laying eggs under the nesting boxes, Marc came up to Sefrou and helped fix up chicken-wire barriers to keep them out. Marc was handy and I was pretty hopeless. In the months of service, I spent a lot of time traveling on weekends. I went up to Azrou early on. Marc was living with a group of guys that worked at the CT. His living conditions were no Posh Corps. The apartment was small, cold, and dark. Azrou is high enough to get seriously cold. I, at the CT, had my own room in a small house, and a heated shower. I was impressed by his adaptability to what I thought were harsh accommodations. I will never forget the bus ride home from that trip. It was early morning. As the bus followed what the French called the belvedere, there was a view to the west over the Pays d’Ito. The valley was in clouds. Dozens of little volcanic peaks poked through them, appearing as an archipelago of islands. Sadly, my camera was not handy and I have only my memories. Nothing is easy when you make it difficult. On that trip down to Rabat, when I was on my way to Spain and Marc was making preparations to leave Morocco, I planned to take a CTM bus from Fes. I bought a ticket to reserve my seat and checked my bag. Carelessly I had placed my passport in my old beat-up and unlocked suitcase. I had a couple of hours to kill, and went to see one of my friends who lived in the Ville Nouvelle. I ended up killing just a little too much time, and I missed the bus. Desperate, I decided that if I were lucky I might hitch a ride to somewhere along the route and catch up with the bus. I soon got a ride. The car was a new Peugeot 504, I think, and the young driver spoke French until I realized that he was an American, who had graduated from the same college as myself. Stationed in the military at the “secret base” at Sidi Yahia in the Gharb, he agreed to drive me to Rabat. Even stopping at the base, we beat the bus and I retrieved my bag and passport. My savior’s parents had served in the U.S diplomatic corps, and he acquired his French, which was excellent, growing up. When you are stuck in Morocco, someone always comes along to help you out. I flew out of Kenitra on a routine Navy flight. Seated next to me was a civilian contractor, probably an ex-military. He worked for Lockheed, I think, training Moroccans to fly F-5 fighters. He was interested in the Peace Corps, quite impressed with my Arabic and French and knowledge of the country. As we flew into the Navy base at Rota, he remarked that he could use a few Peace Corps volunteers in his program. I just let the comment stand. In 1971, F-5 pilots were part of a coup attempt that involved shooting down the Royal Air Maroc passenger jet carrying the King. Embassy scuttlebut has it that Hassan II never really trusted Americans completely after that attempt on his life, believing that the Americans must have had advance knowledge of the plot and could have warned him. The medical exam at Torrejón completed, I was asked if I wanted to go back to Morocco on the next flight. Of course I said no, so I was put on a later flight to Kenitra, and got to spend some time in and around Madrid. Madrid has been the capital of Spain for a long time, and many interesting places surround it that are easily reached by train or bus. I had studied Spanish as my first foreign language, and I could use what I remembered to get around comfortably. It is alway so much better to know a little of the local language. My travels in Iran were immensely enhanced by the fact that I could speak a smattering of Farsi, but that, too, is another story for the blog. At Torrejón I learned that my GS-4 status only got me a crappy shared accommodation on base, so I stayed in a modern hotel near a subway stop off base for about five bucks a night. The airforce wanted as much for the GS-4 accommodations. In Toledo, I stayed in a pension for less. I had been to Toledo before (and would return again), but this time I had some leisure to see the sights, and it was not tourist season. I also visited Ávila and the birthplace of Cervantes in Alcalá de Henares. March is still very cold in Madrid and I do not remember being dressed very warmly. The proverb about Mardrid’s weather, « Nine months of winter, and three of Hell, » has a basis in fact. Interestingly, a year and a half later, as I was leaving Morocco, Gaylord Barr was being airlifted on the same Kenitra to Torrejón flight, with a severe case of typhoid, and he spent a much longer time there than I did! Directly south of Fes, just outside of Boulemane, is a third, lower peak named Tichoukt, which I think means little mountain in Berber. At 2787 meters (a little over 9,100 feet), Tichoukt is close to the town, and an easy climb, requiring nothing more than good shoes, lungs, and feet. There are remnants of a cedar forest, and the area to the east of the mountain has now received a special status as a natural area. 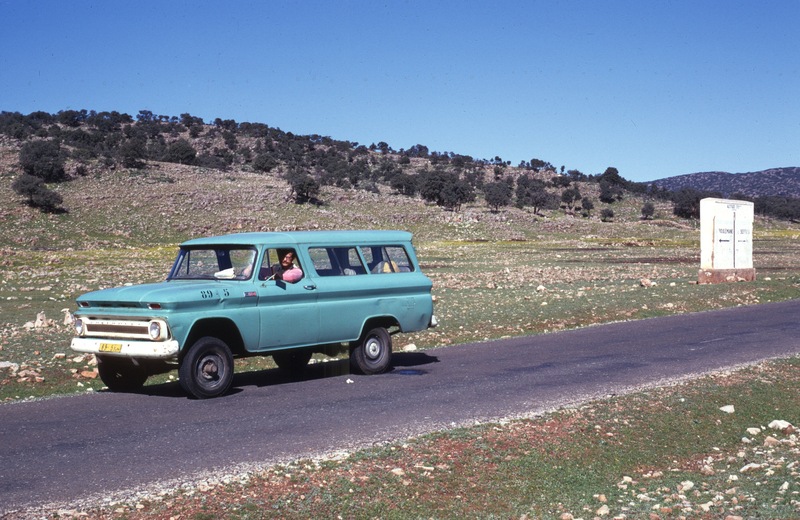 Louden in Peace Corps van, on the Treq es-sultan, between Sefrou and Boulemane. We went up to the summit of Tichoukt three times. The first climb was memorable, because the soles on my boots fell apart. I had given them to Jim Humphrey, living in Rabat at the time, to have them resoled. The shoemaker put the soles on perfectly, but the rubber was so soft that the limestone tore it to shreds. I had hardly any soles left when we returned! Louden on shoulder, looking down toward Boulemane. Louden Kiracofe was with me, but we were disappointed by the views, which were limited by haze and clouds. We just went up the west side of the mountain, which is separated from the true summit by a little saddle. Gaylord Barr and Karin Carter and I climbed Tichoukt in the late fall, but the best ascent was with Louden in the winter. We approached from the south side of the mountain, climbed to the saddle, and just followed the ridge to the top where there was a geodesic marker. The mountain had snow, and the view at sunset was memorable. 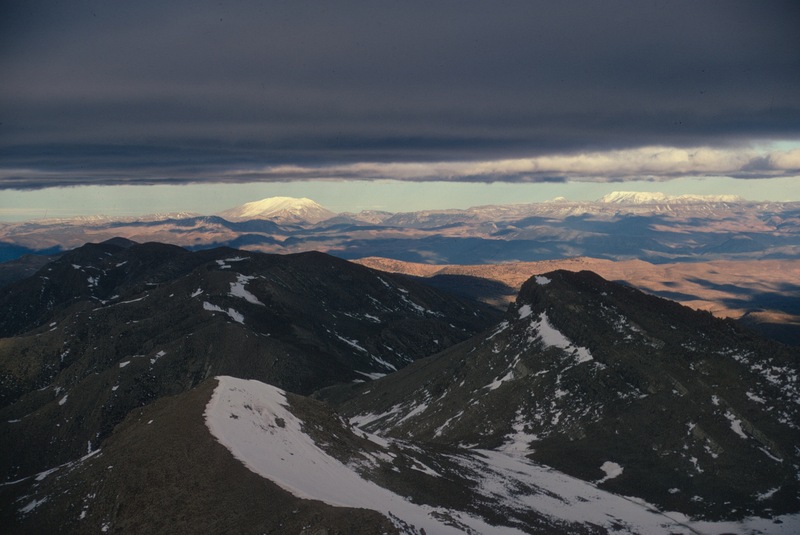 The snow-covered summits of Bouiblane and Bou Naceur were sandwiched between the setting sun and the clouds, in a terrific vista. Looking west from true summit. Bouiblane and Bou Naceur from the summit of Tichoukt. December, 1970. I remember emailing Gaylord Barr, a Peace Corps volunteer who served in the late 1960s in Sefrou, some questions about Madame Mystérie. I was surprised that he did not recall that my reference was to the first missionary to come to Sefrou, in early years of the 20th century. Her name was Maude Cary (I have a little book about her somewhere, published by a missionary society.) Unmarried, she became known as Miss Cary, which made more sense to non-English speakers as Madame Miss Cary as she got older! Of course, I misheard her name Madame Miss Cary as Madame Mystery, mysterious till I figured it out. It seems that my Moroccan friends also knew her as Madame Mestiry. Every one tries to take unfamiliar things and place them in a context that makes sense. Near the end of the French Protectorate, when King Mohammed V did not support the French and spoke out for independence, the French exiled him to Madagascar, then a French colony. For many Moroccans who had never gone to school, Madagascar meant nothing, and some, asked about the King, said that he was sent to see “Madame Cascar.” Madame Cary was a lot like that to us naïve Americans. I think the last missionary, Mr. Jessup, left in 1969 or early 1970. He couldn’t proselytize, and he had nothing to do and spent a fair amount of time fishing. When I told this story to an old friend, Ali Azeriah, he wrote back with his own recollections, and they contain a lot more detail than my own, and his story is interesting. “Now to Madam Mestiry. She too was part of my childhood. I was eleven years old, and I used to go to a school in Derb l’Miter. My family used to live in Setti Mesouda. At that time (about 1958-59) many Jews (the wealthy ones) began to move out of the mellah and settle in such districts as La Ville Nouvelle, Setti Mesouda and Derb l’Miter. So Derb l’Miter hosted many Jewish and Muslim families living side by side and maintaining good neighborly relations. Madam Mestiry, the American missionary, used to live in a house in Derb l’Miter, it being the ‘Beverly Hills’ of Sefrou then. She was well known in the Sefrou community, and especially among pupils my age and teenagers in general, including those who did not attend school. At six o’clock in the evening when we came out of school, most of us students would pass by her house, and there she would be standing at the door of her house with a big smile on her face. She would ask us to come in in Moroccan Arabic ‘Aji! Aji!’ (Come in! Come in!) And a whole bunch of us (ten or twelve of us) would walk in. She would take us to a large room furnished with many chairs, a piano (the first time I saw one), a cross on the wall, and a bookshelf full of books. She would make us sit on the chairs arranged for the event, and she would sing to us hymns in broken Arabic. I can still remember one half sentence from her many religious songs: ‘something (I can’t remember the word) will take me up to the Lord.’ After about twenty minutes or so, she would stop singing, and give us pictures of Jesus Christ and the Virgin Mary. Then she would invite us to the kitchen and give us the thing we cherished most: French bread and cheese or bread and chocolate, one day French bread and cheese, the next day bread and chocolate. Hungry as we were, at 6 o’clock we would flock to Madam Mestiry’s house to be fed food which we had never had at home: Boulanger (French Bread), red cheese and chocolate. We did not care as much about the religious songs or the pictures as we cared about the food, which we, the miserable kids, enjoyed very much. One day my uncle, having found the pictures of Jesus and the Virgin Mary in my satchel, asked me how I came to get them, and I told him the truth. He gave me a thrashing and ordered me to never go to Madam Mestiry’s house. ‘She will make a Christian of you, you donkey.’ I promised him to never go there again. But I did not keep my promise. I just could not resist the temptation of ‘boulanger” and cheese or chocolate. My generation still remembers Mme Mestiry. I do not know any one (from among the circle of my friends) who converted to Christianity, but I heard of some who did actually embrace Christianity. Thanks, Ali, for shedding light on the mysterious Mestiry and the Sefrou that was. I lived in Sefrou, but worked 20 miles away in the provincial capital, Fes. I commuted every day by taxi or bus, which I caught across from the Bab Mkam. During the half-hour rides, I read voraciously. In the early years, volunteers were furnished “book lockers,” collections of classic and contemporary books. The “book locker” collections were a varied mix, and, as volunteers added and subtracted from them, they grew ever more diverse. 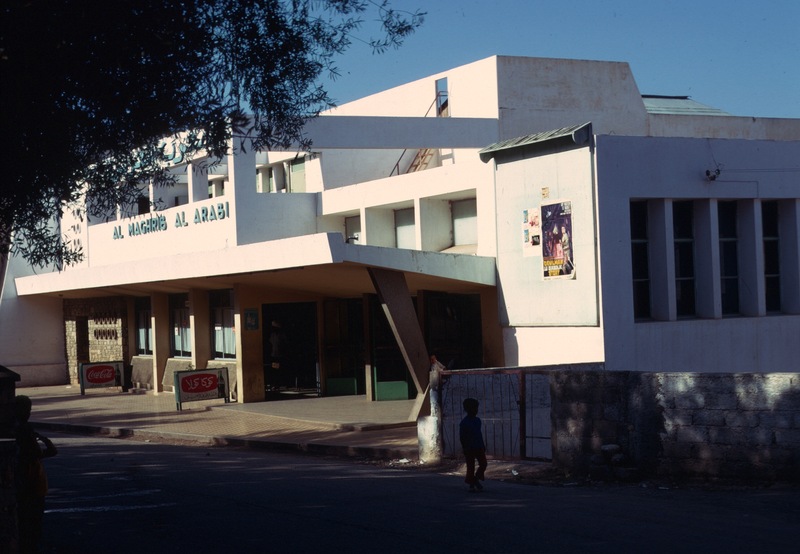 Volunteers visiting Rabat would find book lockers in storage at the Peace Corps office on rue Van Vollenhoven, and look for new titles. The book locker was an American idea, conceived in the earliest days of the Peace Corps. The names of those who put the original collections together seem to be lost. The Peace Corps knew that volunteers in remote places might find it difficult to find reading, and that they would have lots of time to read. In Morocco, I found English language books at a certain newsstand in the ville nouvelle as well as at the missionary run store, La Bonne Nouvelle. I did a lot of reading in French, and searched the medina booksellers for old items on climbing and mountaineering, my passions, as well as history. Since that time, I have never had so much time to read. This may seem like a slow start, but the trivia of everyday existence is as relevant as anything else. I am not aiming at profundity, just a start to the blog.